Our freshly sliced prime cold cut platters and gourmet deli sandwiches stuffed full are not only impressive but delicious and tasty too. 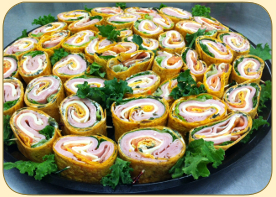 Add any of our party sandwiches to your menu for something different - great for super bowl parties or any fun gathering. Includes: Choice of 2 traditional "Great Salads" from list, sliced tomatoes, pickle chips, condiments, assorted fresh-baked rolls and rye bread. Specialty Salads available at extra charge. 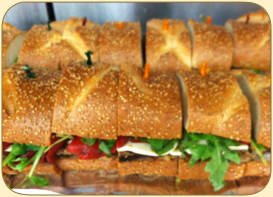 We give a variety that can include all or some of the following sandwiches. Please let us know if there is a particular sandwich you want excluded or included. Buffet includes choice of 2 Salads from traditional "Great Salads" list, pickles and condiments. Choose 2 from list. 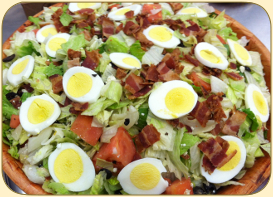 If your headcount is over 40 guests, you may choose an additional "Great Salad" at no extra charge. Your Selection of meats, cheeses or spreads on cocktail rye or party rolls.